We bring artistry back to outdoor lighting. We will give you a landscape lighting demo prior to starting and offer a lifetime warranty. Competitively priced. Servicing Bannockburn IL area. 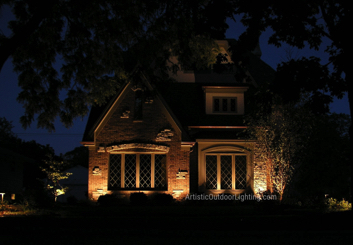 We are your premier source for Bannockburn landscape lighting and outdoor lighting. As 5-time Angie's List award winners serving you for 18 years, we offer 10 year guarantees on all installations and a free in-yard demonstration. We are experts in LED outdoor and landscape lighting and offer the highest level of attention to detail. Bannockburn was founded by Scottish real estate developer William Aitken, who planned a community of "country estates" on 110 acres in inland Lake County. Named for the Scottish village of Bannockburn, the village began construction in 1924 and was incorporated in 1929. Aitken designed his development for the affluent members of his bridge and country club. His plan for Bannockburn featured large lots to imitate country living, and this design has been preserved. Today, Bannockburn is home to places such as the Trinity International University. We provide service throughout Bannockburn IL, including 60015, 60045.